IF YOU’VE EVER found yourself stuck for a session in the gym or at home, or haven’t the money or motivation to pay for a personal trainer than an app known as Freeletics could be something for you.The app is currently one of the fastest-growing fitness trends in the world with over 6 million registered users. It’s received lavish praise from some of the biggest publications in the US and in short, is your own individual training plan. Yes, there are a truckload of those already available but Freeletics has gained such a groundswell of support because of just how individualised it is. Very simply, you do a fitness test so the app can get to ‘know you better’ and design a plan based on your current state of fitness. That test, by the way, is doing as many press-ups as you can in 100 seconds, as many burpees as you can in 300 seconds and as many sit-ups as you can in a similar time-frame – videos of proper technique are provided so you know exactly what’s expected of you. Next, you enter your gender, height, weight and choose your fitness goals, be it strength, cardio or both. After that comes the hardest question of all; how many days can you train, with one being the least and five being the most. Then comes the exciting part…you tailored training plan, featuring exercises that ONLY involve your own bodyweight – so no dumbbells in sight! 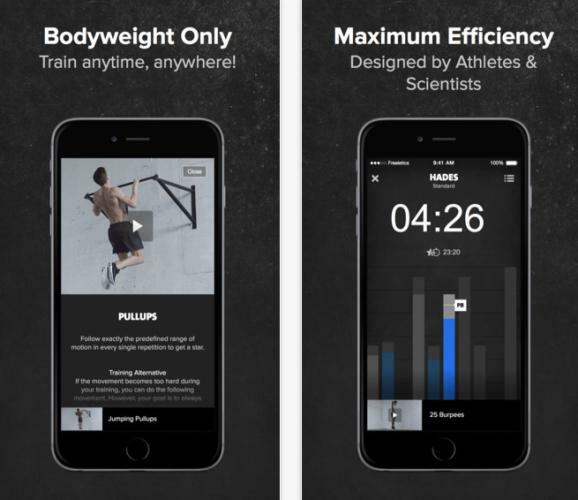 The concept behind Freeletics, so they purport, is one of freedom – ‘You exercise with your bodyweight only. Anywhere, anytime: at home, outside, in gyms, in hotel rooms’.To give you an example, one workout is called after Aphrodite, the Greek goddess of pleasure and involves 50, then 40, 30, 20 and 10 reps of burpee press-ups, squats and sit-ups as fast as possible. Like the name suggests, it’s a free app and bases its exercises on the HIIT (High-intensity interval training) protocol, so it definitely is not easy. But if it’s the body of the Greek God after which each workout is named after, what have you got to lose by trying it out?